You can’t beat the price of $9.99 for a 12oz container. You can find it at Target, CVS, Walgreens, Rite Aid and online stores. Try Amazon Prime 30-Days for free and get 2-day shipping on all your items It’s a great moisturizer for natural hair. I find that during summer months a little goes along way. I can even moisturize every other day but during winter months I tend to use a little bit more since the weather is so dry outside and my hair gets dry faster. I wait until my hair is 10% dry (air dried) then apply Shea moisture organic raw shea butter restorative leave in conditioner, then apply the Shea moisture Smoothie. Seal with coconut oil and twist. Sometimes i use Eco Styler olive oil gel for extra definition. Sleep with the twists overnight and unravel the next day with coconut oil. I use it to Re-Twist every night. It has a sweet pleasant smell (not overpowering) which I love. I use it as a daily hair moisturizer and it’s great for my twist outs or braid outs. The twist outs always come out so soft and super defined and the curls pop really well. A little goes a long way and it’s not greasy at all, and that’s a plus. It’s very buttery and my hair always feels moisturized the whole day. Great for my type 4 hair. It seriously does what it claims. It moisturizes and adds shine. 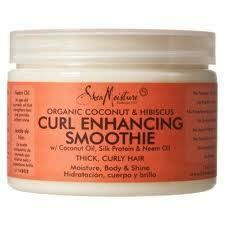 It contains really good natural ingredients great for natural hair and the price is great. Great for Re-twisting at night if your hair is dry. Nutrient rich vegetable butters condition hair, restoring moisture, body and shine. Enhances curls, minimizes frizz and provides curl control. For thick, curly hair. Sulfate-free and color-safe. I hope this will help you newly naturals and for you naturals that want to try another product thats really good for a good price. Make sure you any natural hair tips and product discounts. Enter your email below.